Short-lived climate pollutants are impacting public health, food, water and economic security of large populations, both directly through their impacts on human health, agriculture and ecosystems, and indirectly through their effects on climate. Short-lived climate pollutants have become a major development issue that calls for quick and significant worldwide action. Many regions are already suffering from accelerated climate change. Over the world glaciers are melting, weather patterns changing and sea levels rising while the threat of overshooting the 2ºC "safety" target is looming. Due to their short lifetimes, compared to CO2 which remains in the atmosphere for approximately a century, actions to reduce emissions of short-lived climate pollutants will quickly lower their atmospheric concentrations, yielding a relatively rapid climate response. Fast action to reduce short-lived climate pollutants, especially methane and black carbon, has the potential to slow down the warming expected by 2050 by as much as 0.6 Celsius degrees. 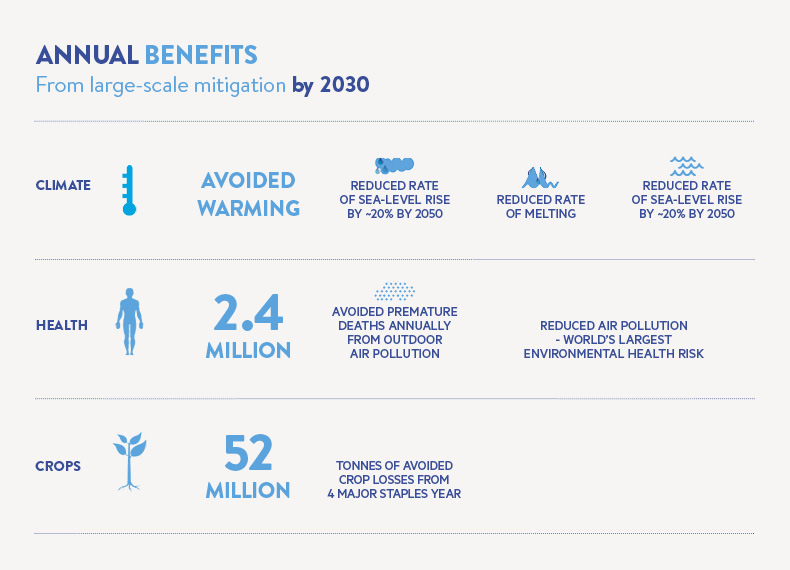 However, if mitigating short-lived climate pollutants will help to reduce the rate of global warming and avoid exceeding the 2°C target over the near term, long-term climate protection requires deep and rapid cut in carbon dioxide emissions. Every year, nearly 7 million people die prematurely from indoor and outdoor air pollution. Short-lived climate pollutants are largely to blame. Fast actions on short-lived climate pollutants, such as the widespread adoption of advanced cookstoves and clean fuels, have the potential to prevent over 2 million of these deaths each year. Feeding a growing world population has become one of the major issues of our century and we cannot afford to lose millions of tons of crops each year because of air pollution. 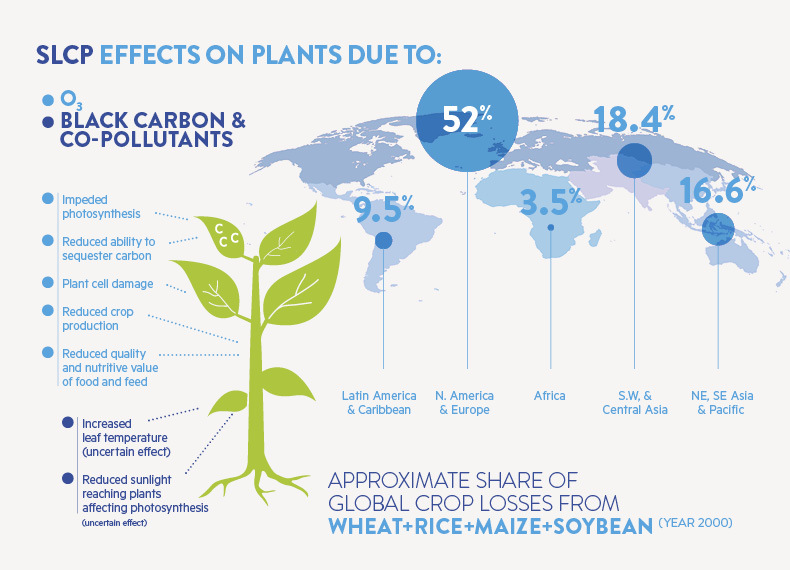 Present day global relative yield losses due to tropospheric ozone exposure range between 7-12% for wheat, 6-16% for soybean, 3-4% for rice, and 3-5% for maize . In addition, black carbon influences the formation of clouds that have a negative effect on photosynthesis that impacts plants growth. Rapidly reducing short-lived climate pollutants, for instance through the collection of landfill gas or the recovery of methane from coal mines, has the potential to avoid the annual loss of more than 50 million tons of crops. HFCs are man-made fluorinated greenhouse gases used as replacements for ozone-depleting substances (ODS). These chemicals have no known natural sources, and they are being used in the same applications where ODS have been used: air conditioning, refrigeration, fire suppression, solvents, foam blowing agents, and aerosols. Most importantly, HFCs are rapidly increasing in the atmosphere. Though HFCs currently represent a small fraction of total greenhouse gases, their warming impact is particularly strong, and their emissions are projected to increase nearly twentyfold in the next three decades if their growth is not reduced. The most commonly used HFC is HFC-134a, which is 1,430 times more damaging to the climate system then carbon dioxide. Emissions of HFCs are growing fast. 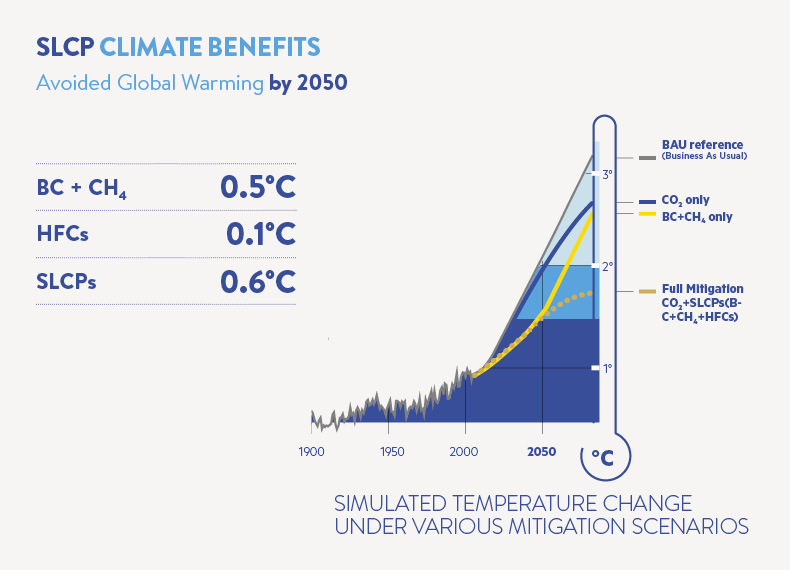 As a result, HFCs emissions could offset much of the climate benefits from the Montreal Protocol. They are projected to rise to about 3.5 to 8.8 Gt CO2eq in 2050, comparable to total current annual emissions from transport, estimated at around 6-7 Gt annually. There are options available that could avoid or replace high-GWP HFCs in many sectors and also ways to reduce emissions.